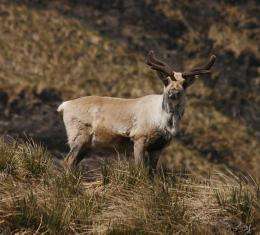 The Biotechnology and Biological Sciences Research Council (BBSRC) funded team from UCL (University College London), and the University of Tromsø, Norway, showed that the colour change helps reindeer to see better in the continuous daylight of summer and continuous darkness of Arctic winters, by changing the sensitivity of the retina to light. Arctic reindeer, like many animals, have a layer of tissue in the eye called the tapetum lucidum (TL) which lies behind the retina and reflects light back through it to enhance night vision. By changing its colour the TL reflects different wavelengths of light. In the bright light of summer the TL in Arctic reindeer is gold, similar to many other mammals, which reflects most light back directly through the retina. However by winter it has changed to a deep blue which reflects less light out of the eye. The team believes this would be an advantage in the prolonged murk of winter, allowing reindeer to more easily detect moving predators and forage. Lead researcher Professor Glen Jeffery from UCL, said: "This is the first time a colour change of this kind has been shown in mammals. By changing the colour of the TL in the eye reindeer have flexibility to cope better with the extreme differences between light levels in their habitat between seasons. "This gives them an advantage when it comes to spotting predators, which could save their lives." The colour change may be caused by pressure within the eyes. In winter pressure in the reindeers' eyes is increased, probably caused by permanent pupil dilation, which prevents fluid in the eyeball from draining naturally. This compresses the TL, reducing the space between collagen in the tissue and thus reflecting the shorter wavelengths of the blue light common in Arctic winters. Previous work from Professor Jeffery and Norwegian colleagues from Tromso had shown that Arctic reindeer eyes can also see ultraviolet, which is abundant in Arctic light but invisible to humans, and that they use this to find food and see predators. The blue reflection from the winter eye is likely to favour ultra-violet sensitivity.